Two Pro Wrestling Tees employees were allegedly told they could not enter tonight’s SmackDown taping wearing All Elite Wrestling merch … Pro Wrestling Sheet has learned. The employees tell us they were in line to buy tickets when a security guard approached the box office to inform them they wouldn’t be allowed inside wearing the AEW merch. He then told the woman selling tickets to not sell them any unless they change clothing. 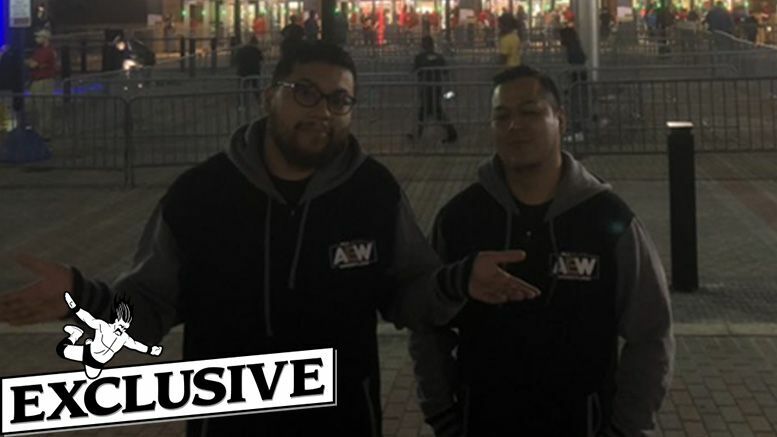 We’re told the PWTees employees asked for something official saying they couldn’t enter in AEW merch, but were not given an answer and security walked away. As we previously reported, today’s rally down the street confirmed the involvement of Chris Jericho and PAC. AEW also said women will be paid equal to men, wrestler care is important and more. After publishing the article, a rep for WWE reached out claiming there was no directive told to security tonight which would ban people from entering the building wearing AEW merchandise. This would seem to be contradicted by the below video, however, which shows security tell a fan they were initially not allowing people to enter in AEW merchandise … but something changed. UPDATE: After seeing the arena changed their stance, the two PWTees employees later returned to try again. This time the same security guard told them something had changed and they would now be allowed inside the building to enjoy the show.